A few still available! 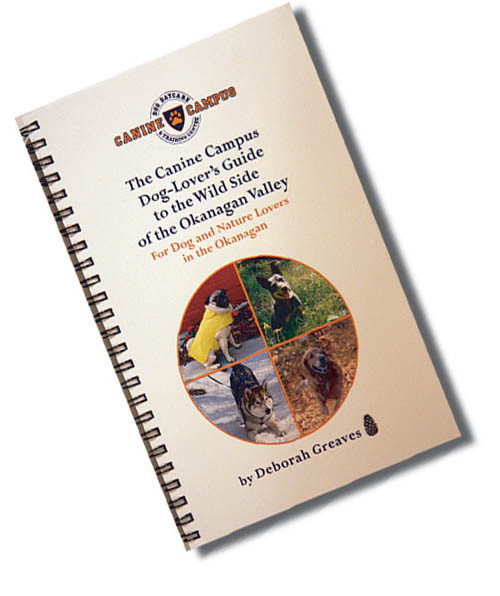 The Canine Campus Dog-Lover’s Guide to the Wild Side of the Okanagan Valley! In partnership with Canine Campus Dog Daycare and Training Centre, we’ve published a book for dog people in the Okanagan. It’s "The Dog Lover's Guide" to the Wild Side of the Okanagan Valley, a custom-made book priced at $24.95, with plastic covers and sturdy steel binding. It’s a modest size so it can be taken along on hikes- a great gift! Like the other Guides in our series, this book contains photos of plants, trees and animals that may be encountered throughout the Okanagan Valley, some taken by people you'll know. There’s information about natural areas that people can explore and enjoy with their dogs, even advice about what to wear and take along for both people and dogs in the heat or cold while exploring the Okanagan Valley’s four-season delights. Though this is a casual and light-hearted book, written with Canine Campus clients and people who may be new to the Okanagan Valley in mind, the information in this book was carefully researched. Laws regarding dogs on leash and dog interaction with wildlife are listed, as well as related websites and books that readers may wish to investigate. We’ve either lived or learned everything that’s in this book. You’ll find information on parks, trails and crown lands that are appropriate to visit with dogs, and advice as to whether those areas are suitable for visiting with 'sedate' or 'rambunctious' dogs. Estimations of the time involved for each trek are also included, and whether it is advisable to take, or tell a friend where you're going. The Dog Lover's Guide to the Wild Side of the Okanagan Valley is available at Canine Campus Dog Daycare and Training Centre in West Kelowna near Byland's Nursery. Canine Campus is in a small industrial complex, Compass Court, just off Hwy 97- it's at #9, 2652 Compass Court just west of Bartley Rd and Hwy 97. The phone # is 250-859-3647 , and the “Campus” website is www.caninecampusdaycare.com. When you order a minimum of 50 guides, the books will be customized with your logo and an informative page with messages and photos you or your company would like to share with your customers about the valley and its environment. There are Valley-wide editions as well as Guides to the Wild Side for very specific locations. Added text, approximately 400-500 words, can be added, specific to you and/or your organization. These guides can be also be customized very specifically to certain areas, with a minimum order of 100 books per area. For example, a Vernon business or individual may wish to have information included about its famous ski resort, Silver Star, and other attractions unique to the Vernon area. The South Okanagan may wish to discuss its desert parks and animals such as Bighorn Sheep. Extensive work is required for these additions, thus the 100-book minimum. However, subsequent reorders can be as few units as 20 at a time.